James Dowson (pictured), a British citizen and far-right figure residing in Hungary, has been banned from the country, Hungarian newspaper Magyar Narancs reported Wednesday. The Hungarian Interior Ministry issued a statement explaining that Dowson has been deemed persona non grata upon the suggestion of TEK, Hungary’s anti-terror organization. Magyar Narancs reported that had it received information earlier saying Dowson was considered a threat to Hungarian national security. 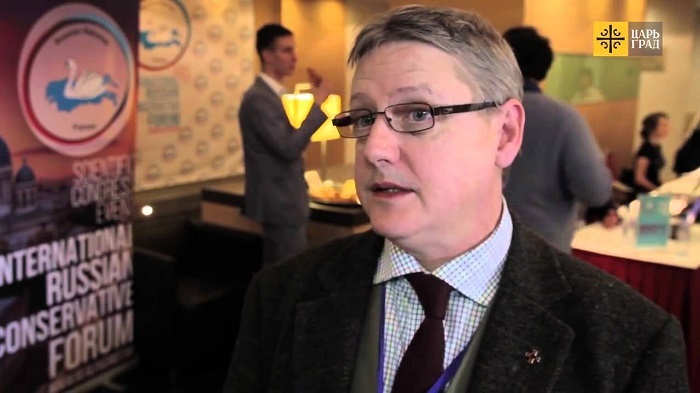 The Budapest Beacon has already reported that Dowson, a Scottish Calvinist Minister and former member of the British National Party (BNP) and Britain First, is among a group of far-right Western Europeans active in Hungary who maintain close ties to local extremist groups. Heavily pro-Russian, Dowson oversees an international media network that has been accused of spreading fake news. Dowson, along with fellow British far-right politician Nick Griffin, attended a “Stop Operation Soros” conference in Budapest in March. One Hungarian far-right group involved in organizing the conference — Identitesz — is now reportedly in the process of setting up a political party. Another group participating in the creation of this new political force is Betyársereg (the Army of Outlaws), an organization both Dowson and Griffin had contact with while in Hungary. Magyar Narancs reported that Identitesz has recently moved its offices to an apartment formerly associated with Dowson at Budapest’s Teréz körút 24. At the same time, Dowson and Griffin maintain close ties to László Toroczkai, the extremist vice-president of Jobbik and mayor of the border village of Ásotthalom, near Serbia. This is not the first time a far-right foreign politician has been declared persona non grata in Hungary: Richard Spencer, an American white nationalist, was detained while attending a conference in Hungary in 2014 and promptly banned from the Schengen zone. But Dowson’s case is unique: he is an EU citizen, was not arrested, and had been residing full-time in Hungary before the authorities made a decision that he is a threat to national security.